Stroke. 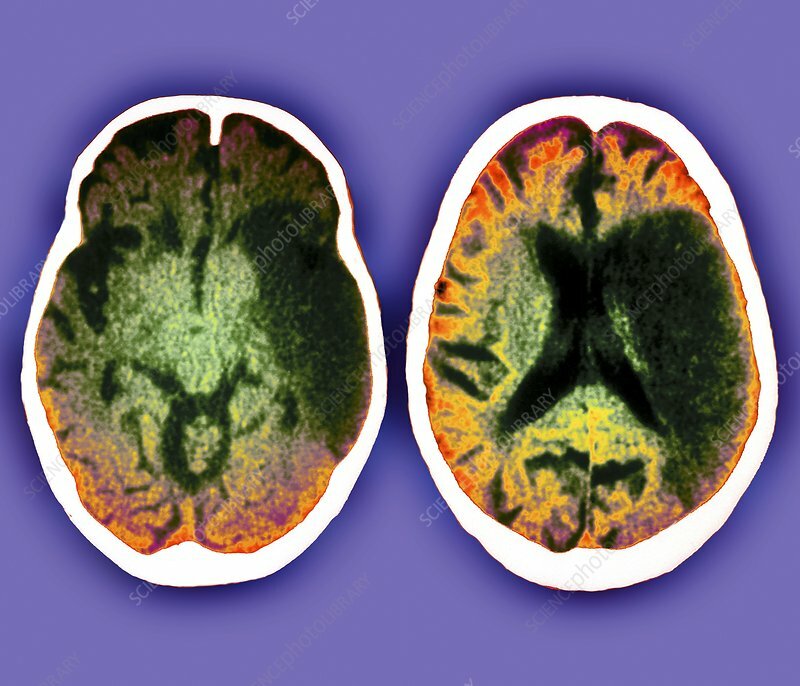 Coloured computed tomography (CT) scans of axial sections through the head of a 62-year-old patient with a stroke. The front of the brain is at top and the right hemisphere is seen at left in the sections. A large infarct (dead tissue, dark patches at right) is seen in the sylvian fissure of the left hemisphere. The infarct is a result of ischaemia, a lack of blood flow caused by a blood vessel obstruction. The blockage may be due to a thrombus (blood clot) or embolism (air bubble or loose blood clot). Strokes can be instantly fatal, or may pass unnoticed. Symptoms can include muscle weakness, behavioural changes or paralysis.